The first record of a European in Borrego Valley was when Lieutenant Pedro Fages of the San Diego Presidio came in search of deserters in 1772. His pursuit led him northwest through the present town of Borrego Springs and up Coyote Canyon. This event was related by Kumeyaay Indians to members of the first Anza expedition, who camped at their village in March, 1774. The Spaniards called this village (and spring) just east of the Borrego Sink, San Gregorio. It is the location of the original Borrego Spring. It was another hundred years before cattlemen began homesteading the Borrego Valley, in about 1875. The first successful well was dug in 1926, which quickly led to irrigation farming. By then, the town contained a post office, a small general store, and a gas station. The presence of both the Army and the Navy during World War II brought the first paved roads and electricity to Borrego Springs. After the war, developers subdivided the area, attempting to create a resort community by capitalizing on the tourism generated by the state park. 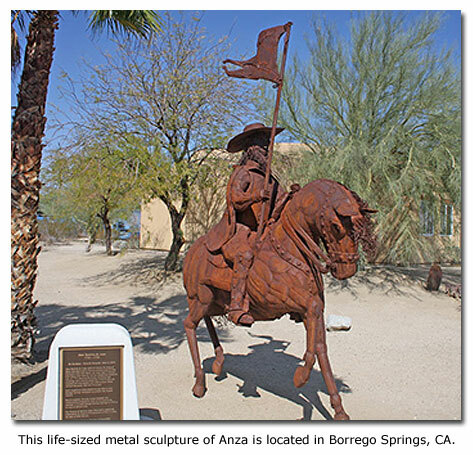 The town Borrego Springs was never incorporated and, therefore, has no mayor or other form of municipal government. History is unfolding in a town already filled with its own unique historical milestones. 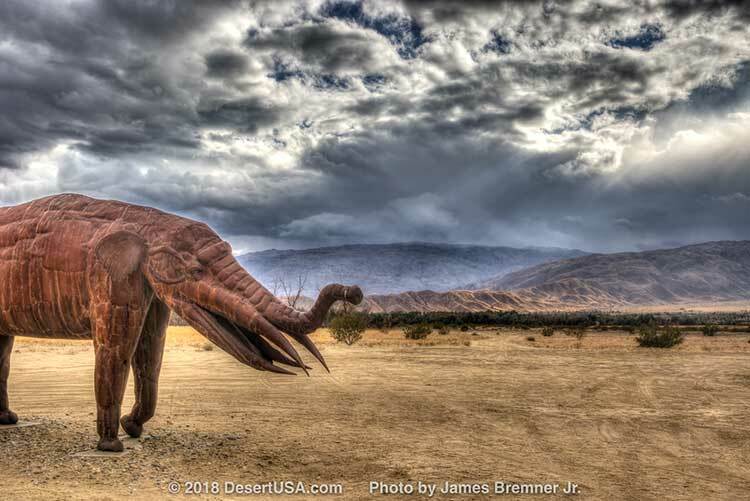 Borrego Springs has a new exhibit: 130 free standing art sculptures in the Galleta Meadows. For more pictures, a video, and a map showing where they are located. Free standing art structures, the gomphotherium is back. Anza-Borrego Desert State Park has camping opportunities throughout its 600,000 acres. The busy season is Nov – March and most weekends get full pretty fast. For reservations, call 800-444-7275. Camping is site-specific, so it’s a good idea to have a particular campsite in mind when you call for a reservation. For more information call the park at 760-767-5311. 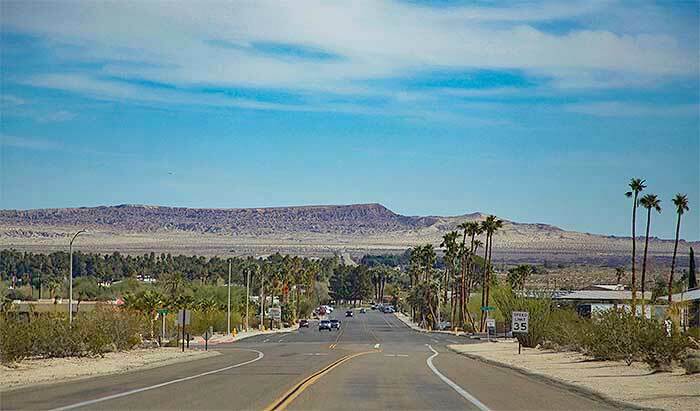 This celebration marks the official kickoff of the tourism season with events including a parade, the Miss Borrego Pageant, dances, carnivals, live music, arts and crafts. Pegleg Liars Contest - First Saturday in April - 7pm The 102nd Anniversary of the Peg Leg Smith Liar’s Contest will be held for the first time at the American Legion Post #853. This new location will afford the benefits of dinner prior to the contest if desired, and restroom facilities. Briefly, here are the rules.......there are none! It’s a liar’s contest! County Highways S-3 and S-22 meet in downtown Borrego Springs. The Salton Sea is 30 miles to the east following S-22. Borrego Valley Airport is located approximately 3 miles east of Borrego Springs. It has a pilot-activated, lighted, 5000-foot runway, fueling and space for overnight and longer stays. It is student pilot-friendly and has late-model rental cars available, a restaurant and information on numerous other activities. It also offers the Anza-Borrego Desert State Park Sky Trail that gives pilots and their passengers a chance to enjoy natural and historic features of the park, many of which can only be viewed from the air. The Borrego Valley Airport has 99% clear skies. History is unfolding in a town already filled with its own unique historical milestones. Borrego Springs has a new exhibit: Free standing art structures. Click here for more pictures, a video, and a map showing where they are located. Learn about the story behind the art. Borrego Springs is often listed as the hottest place in the U.S. on certain summer days. All-time high monthly precipitation was 5.07 inches in September 1983 due to Hurricane Kathleen. The highest temperature recorded at Borrego Springs was 121 degrees in June, 1996. Note: All weather statistics listed for the town of Borrego Springs are recorded by rangers at the Anza-Borrego Desert State Park Headquarters, 1.5 miles northwest of downtown. The elevation of the park visitor center is 780 feet above sea level, but the town itself is actually about 100 feet lower. The town is, therefore, less windy and tends to have greater extreme temperatures than those recorded in the park. Julian, California: 20 miles west. Palm Springs, California: 90 miles north. San Diego, California: 78 miles west. Cuyamaca Ranch State Park: 25 miles west. Agua Caliente/Vallecito Regional Parks: 44 miles southwest. Ocotillo Wells Vehicular Recreation Area: Adjoins the park on the southeast corner. Imperial Sand Dunes: 70 miles east. Salton Sea National Wildlife Refuge: 80 miles southeast. Salton Sea State Recreation Area: 65 miles northeast. Superstition Mountain Off-Highway Vehicle Area: 55 miles miles east. Tumco/Hedges Ghost Town (BLM): 85 miles east.